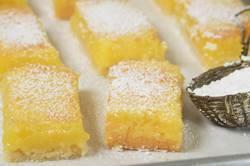 Lemon Shortbread Bars: Preheat your oven to 350 degrees F (180 degrees C) and place the oven rack in the center of the oven. Butter, or spray with a non stick vegetable spray, a 9 x 13 inch (23 x 33 cm) pan. Shortbread Crust: In your food processor, place the flour, sugar, and salt and process to combine. Add the vanilla extract and cold butter and pulse until the pastry starts to come together and form clumps. Transfer the pastry to the prepared pan and, using your fingertips, evenly press the pastry onto the bottom of the pan. Gently pierce the crust with the tines of a fork. (This will prevent the pastry crust from puffing up while it bakes.) Bake for about 20 - 25 minutes, or until the crust is golden brown around the edges. Remove from oven and place on a wire rack to cool while you make the filling. Lemon Filling: In a bowl rub the lemon zest into the sugar. Stir in the flour and salt. In another large bowl, whisk the eggs. Gradually whisk in the sugar mixture until smooth. Add the lemon juice and stir to combine. Pour the filling over the shortbread crust and bake for about 25-30 minutes, or just until the filling has set. Remove from oven and place on a wire rack to cool completely. To Serve: Cut into squares and dust with powdered sugar just before serving. The Lemon Bars can be stored in the refrigerator for four to five days. Yield: About 24 Lemon Bars.